As an eco-friendly household, I try purchasing items for my family and friends that are not just useful, but good for the environment too. One of the hardest things for me, however, is finding toys that are perfect for small children that are both eco-friendly and fun. In the past, green toys tended to be boring, simple toys that couldn’t keep a child’s attention for very long (which leaves you wondering how ‘green’ they really are). Luckily for today’s parents and other gift givers, those days are a thing of the past – many small companies are working hard to create eco-friendly toys that are fun, educational, and good for the environment! With so many different start ups and toy companies trying to make these sorts of toys, I thought I would do my part to make toy shopping a bit easier for our busy readers, with this list of 25 eco-friendly gifts for kids. Now, understand I am writing this list not only as a concerned aunt, but as a teacher too. Having worked in a both normal and special education settings, I try finding fun, unique toys that I think would be safe (and fun!) for young children and children with special needs. Most of these toys are for children 6 months to about 8 years old, so keep that in mind when looking at this list of 25 eco-friendly gifts for kids. Also, if you have anything you think should be added to the list, feel free to suggest it in the comments and I will add the toy to our list. My hope is to ly have a wide-ranging list of eco-friendly toys to make shopping for Christmas, Easter, birthdays, and other holidays easier on families and their friends. As a fair warning, I am a big fan of the Green Toys company. All of their toys contain no BPA, phthalates, PVC, lead free, and made using no external coatings, to avoid children being exposed to toxins. They also make all of their toys right here in the United States, using locally supplied materials to minimize transport and emissions impacts. Along with their toys being made from 100% recycled milk jugs, all of their packing is made from recycled products and soy inks. To me, this makes many of the Green Toys products perfect for our 25 eco-friendly gifts for kids list, since their toys are safe for kids and help the local economy. I am in no way associated with the company – I just think they make great toys! To be honest, this is one of the cutest and eco-friendly toys on the 25 eco-friendly gifts for kids list. This tool box is a 15 piece set that includes a tool box, Phillips screwdriver, flat screwdriver, hammer, saw, wrench, pliers, 2 two-hole connectors, 2 nails (also plastic, don’t worry! ), 2 bolts, and 2 nuts – making it the perfect set for little future builders! As well, this toolbox is made from 100% recycled milk jugs right here in the United States. As a teacher, I love that this toy encourages gross and fine motor skill development through imaginary play. With this set being available in blue and pink, the Green Toys Tool Set is perfect for boys and girls! This is another great Green Toys product design to work on young childrens’ motor skills. What I like about My First Stacker is that it is one of the few stacking toys designed with a baby in mind. It includes eight colorful and stackable nesting pieces that do not require a center post to function. This is safer and better for small children since it gives them large pieces to manipulate in their small hands. As well, it is perfect for teething for smaller children since it contains no toxic chemicals, like all Green Toys products. As children get older they can also use this stackable toy to improve hand-eye coordination and color recognition. The My First Stacker is also dishwasher safe for easy cleaning. If you have a little one that loves trucks and construction equipment, the Green Toys Dump Truck is perfect for your little one! This dump truck is made here in the United States from 100% recycled plastic milk bottles and includes no metal axles. The Green Toys Dump Truck has won awards due to innovative eco-friendly design that encourages imagination and motor skill development – but all your child will see is a fun moveable truck with working dumpster! Unlike some dump truck toys, this comes pre-assembled, sparing parents any assembly hassle and allowing kids to play with it right out of the box! 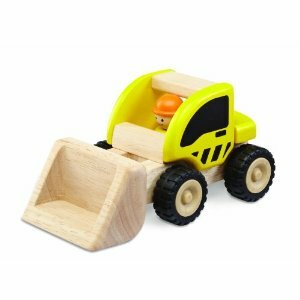 If you are someone who loves old fashioned wooden toys, we think you will love giving the Wonderworld Mini Loader Wooden Vehicle to a special child. This toy is made using only water based, non-toxic paints and rubber wood – a fast growing, replenishable resource. This toy’s unique design is the perfect size for little hands and comes with a little operator that moves up and down as he ‘drives’ the vehicle. This eco-friendly toy is perfect for working on fine motor skills. When Plan Toys made the Green Dollhouse, they had the three Rs of green living in mind – Reduce, Reuse, and Recycle. Due to this house’s eco-friendly design, it has won numerous educational merits, recognition and awards in the toy industry. Unlike many traditional wooden dollhouses, the Green Dollhouse is made using 100% natural, fast-replenishing materials like rubber wood. 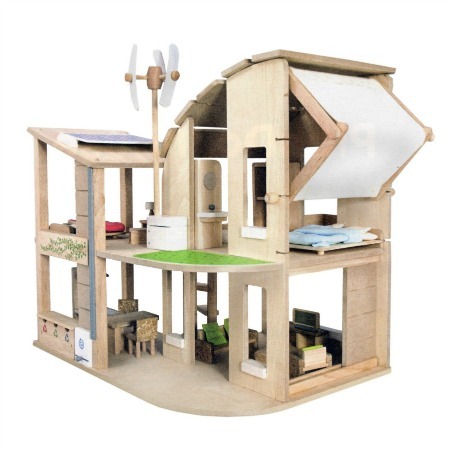 The best part of this dollhouse, however, is that it teaches children to live an eco-friendly lifestyle through imitation. The house showcases the best in modern eco-friendly living, featuring an electrical inverter for generating power, adjustable sunlight and air circulation, shaded canopy, a turbine, and more! Unlike most dollhouses, the Green Dollhouse also includes furniture, something that can be very expensive for parents when they purchase a dollhouse for their children. With all the green living surprises in this house, it was a must-include for our list of 25 eco-friendly gifts for kids. MADE IN THE USA BABY! THAT SELLS ME EVERYTIME. ALSO I LOVE HOW EACH TOY SEEMS TO BE MADE. THEY DON'T SEEM CHEAP! I love the tool box and the fact that it is made from milk jugs. Very cute. The doll house is very unique and very modern. The "wind energy" feature is so cool! Great suggestions. Look forward to the next round. I do too! They are so well made and encourage children to use their imaginations! We have a number of Green Toys! I love that they are eco-friendly and durable! I agree! Sometimes the simple games are important too since it encourages kids to use their imaginations! I'm loving that dump truck and I have a niece who just turned one in August. this looks familiar, i knew it. hehhehhe I was fortunate enough to be able to review one of the greentoys product. I review their dump truck and my son was overjoyed when he opened the box and saw what it was. I have to say that doll house looks awesome! I wish I had someone to give it to. I love the doll house, and these toys look so well made, thank you for sharing..
Wow these are some great gift ideas! Thanks for sharing. Thanks for all this great information. I love how many eco-friendly options there are this year. I love this list! I try to lean toward eco-friendly gifts for my son and other kids. They are so much more durable and attractive than standard plastic toys… and of course the environmental benefits!